This lens covers the ultra-telephoto range up to 800 mm. By continuously varying the angle of view from 8.2º to 3.1º, the lens takes a lot of the footwork out of picture composition. This digitally optimised lens covers the ultra-telephoto range up to 800mm and has a fast maximum aperture. Its new lens coating reduces flare and ghost, which is a common problem with digital cameras. It incorporates two ELD (Extraordinary Low Dispersion) glass elements for effective compensation of chromatic aberrations and also ensure sharp, quality images. Addition of an HSM (Hyper Sonic Motor) makes fast, silent AF function a reality. The lens is also capable of full-time manual focus. 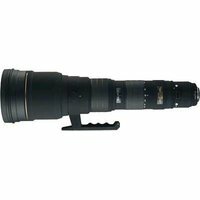 Since zooming does not change the lens overall length, the lens is easy to hold and use, and by adding a DG Teleconverter (sold separately) you can use this lens as a 420-1120 mm F8 MF ultra-telephoto zoom lens with a 1.4x EX Teleconverter, or as a 600-1600 mm F11 MF ultra-telephoto zoom lens with a 2x EX Teleconverter.